This Crab Apple (Malus sylvestris), belonging to a client, came to me during March 2016 for repotting, carving, wiring and styling. The tree had something of a chequered recent history. 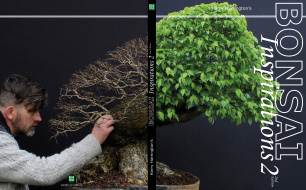 Purchased by its current owner in 2010, it had been given an initial styling during 2011 before dying back badly after a fertilizer-accident that resulted in the loss of the main trunk. 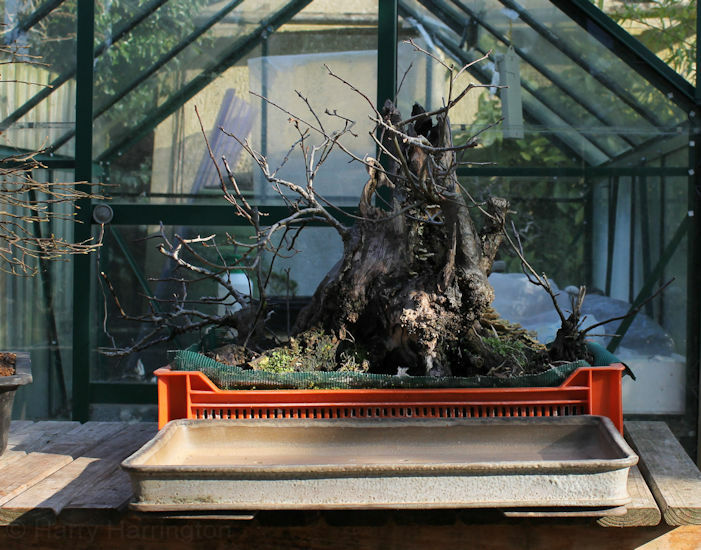 The Crab Apple, and its new bonsai pot, after arrival in my garden. The tree itself was huge; at over 50cm (half a metre) in diameter, it was the biggest Crab Apple I had seen! Pictured was the tree as seen from its intended new front; the original main trunk was now to the rear of the tree. A number of the suckers that had emerged after the fertilizer accident can be seen around the dead main trunk and these were eventually used to build new (live) trunklines and a branch structure. The front-left view of the Crab Apple. The Crab Apple seen from the right-hand side, covered in bracket fungus. The right-hand side of the tree, showing the now-dead main trunk. As can be seen, the dead trunk had rotted badly and was covered in bracket fungus. Although the fungus itself was harmless to the actual health of the tree, it was unsightly and indicated that wood was still rotting. Without removal and curing of the wood, the main trunk would eventually crumble away. Removing the bracket fungus, as seen from the right-hand side of the tree. 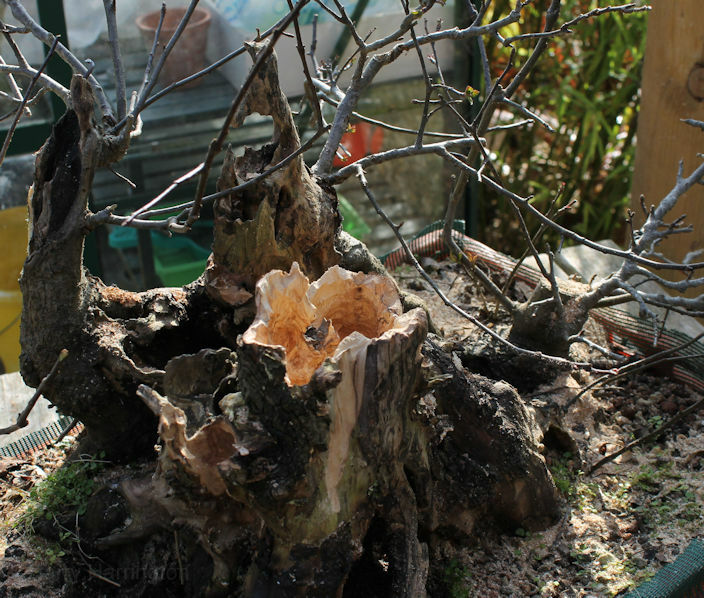 My first task was to cut away the fungi with a knife and scorch the deadwood underneath with a blow-torch. This burning would kill the fungi, and also protect the wood itself, as burnt/charred wood would not be subject to fungal attack in the future. Roughing-out: the first carving of the main trunk. On further inspection I found that the outer shell of the deadwood was very hard and that the interior wood, the heartwood, that had become very soft and pulpy. Simply using a Dremel mounted with a steel wire brush, I was able to brush away the soft, rotted wood leaving the hard exterior intact, to great effect. Then using other tougher cutting-bits, I reduced and shaped the outside shell. My aim was reduce the height of the old main trunk so it did not visually dominate the new front, and allow it to be create a big hollow interior to the tree itself. The right-hand side of the tree after hollowing-out the dead trunk. The outside lip of the shell was reduced in thickness, from the inside and the outside, to create the illusion of a more delicate, and contoured edge. As a deciduous bonsai, I wanted to replicate an old naturally rotted tree and this meant that the deadwood would not have stark white deadwood carved along its grain. Rather it would have a hollow shell comprising a mixture of whites and greys. As there was some bark still strongly attached to the deadwood, this was left in place to create an additonal point of interest to the finished product.